In 1915, Jesse Wright (1898-1990) and her husband, Perry, homesteaded nearby. The trail will take you along an old roadbed, into Dark Canyon, through a forest of Douglas-fir and big-leaf maple, and below the volcanic remnants of Eagle Rock and Old Man Rock. Several side trails intersect with this segment. The Illahee Flats Trail (1 mile) leads to a scenic Cascade meadow used in the past as an American Indian gathering place and a Forest Service Guard Station; and now as a popular area for equestrians. The Boulder Creek and Bradley Trails provide a loop trail through the Boulder Creek Wilderness. Both trails are closed to mountain bikes. 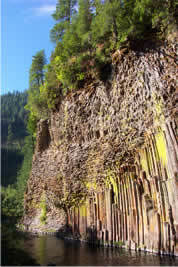 When molten lava flowed, then cooled, these vertical columns were formed. Over the years, brightly colored lichens have grown adding spectacular contrast to the unique pillars.